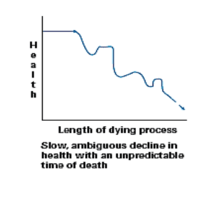 Death Trajectory is known as the pattern of dying when one is given a projected death date, and there is no other means other than comfort care for the remaining existence of the individuals life, “the time between the onset of dying and the arrival of the death”. Death trajectory is not biased when it comes down to the nature that is the trajectory, whether it be a sudden death, chronic illness, or the long steady decline in health due to senescence. Dying trajectories were first studied in the 1960s by two researchers, Barney Glaser and Anselm Strauss, in order to understand how humans decline with different ailments. Death trajectory is split into two different sections: duration and shape. Duration, meaning length of physical time a patient has to live anywhere from instant death to several months. Shape, a little bit trickier to understand, would be described by how that duration is then graphed. In other words, shape is “the course of dying, its predictability, and whether death is expected or unexpected”. These properties come more from the onlooker, therefore, making death trajectories “perceived courses of dying, rather than actual courses themselves”. Depending upon the diagnosis of the patient, trajectory and near, end-of-life plans can vary. 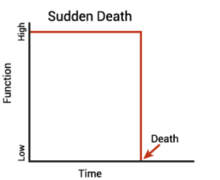 Death trajectory can have many faces, however depending on how the individual is dying will depend on the trajectory. In certain circumstances such as a sudden death, death is unknown to both the individual and the family and is considered a difficult fall. These types of deaths consist of fatal car accidents, myocardial infarctions, as well as a severe stroke. The death trajectory can be occur within hours to a few days. Chronic Malady is another type of downfall that can take a loved one's life. Examples of this type of death could be autoimmune diseases, HIV, or other incurable illnesses. The death trajectory projects emotional stress or turmoil, until eventually the patient may become mentally and emotionally exhausted. The trajectory here is made more distinct to the family, and the patient, therefore making goodbyes and future plans more possible. Cancer related deaths are both easy to prepare for as well as hard to deal with because there is usually no hope for a curative approach, and death is imminent. Much like other chronic maladies, there is time to prepare for future plans, memories, and goodbyes. However, this varies with different types of cancers as some are quick growing, such as pancreatic cancer, while others are much slower, such as prostate cancer. Natural death is typically a long steady decline in regard to old age. In these cases, death trajectory is based more on how the mindset degenerates and the speed of organs failing. Most times goodbyes are well thought out and most family’s are well within knowledge that it is inevitable they will sooner rather than later lose the family member. When an individual had been given a death date and have a death trajectory, at this point they will drop curative care, and proceed onto comfort care. Curative care is when the patient still feels fight for their life and will continue to use current medical care in hopes of recovering or becoming stable enough to carry on with life. Comfort care is when a patient has accepted the reality that death is unavoidable, and will need to take the next steps in order to make the death as painless and comfortable as possible. More than often patients whom have been given a death date and have a death trajectory are emitted into a hospice, and will die in the care of these programs and expertise. There is often bereavement offered to the families, most often for up to 13 months. Many times just having the strength to talk about the death can benefit both the dying, and the family and friends. Death trajectory was first studied with cancerous patients, in that knowing that death was coming and that it has close to a specific date. However, death trajectory is still being studied to this day, and can sometimes still be misunderstood due to ‘medical miracles’. Having a framework to this study is helpful to family, friends, and patients that need to understand what their futures hold for them, and exactly how much time they have to come to terms with the death whether it be themselves or another loved one. 1 2 3 4 5 6 Corr & Corr (2012). Death & Dying, Life & Living, Seventh Edition. Cengage Learning. ISBN 978-1111840617. ↑ "Preparing to say Good-Bye" (PDF). University of Hawaii. Retrieved 20 November 2014. ↑ Dickenson, Johnson & Katz (2000). Death, Dying and Bereavement. SAGE Publications Ltd.
1 2 3 4 Quan, Kathy. "Dying Trajectories". netplaces.com. Retrieved 20 November 2014. ↑ Gerstorf, Denis; Ram, Nilam; Lindenberger, Ulman; Smith, Jacqui (2013). "Age and time-to-death trajectories of change in indicators of cognitive, sensory, physical, health, social, and self-related functions.". Developmental Psychology. 49 (10): 1805–1821. doi:10.1037/a0031340. 1 2 Penrod, J.; Hupcey, J. E.; Baney, B. L.; Loeb, S. J. (27 September 2010). "End-of-Life Caregiving Trajectories". Clinical Nursing Research. 20 (1): 7–24. doi:10.1177/1054773810384852.